Experts say that there are at least five to 10 pounds of chemicals found in cleaning products per household. If that estimate is true, it is important to try to find cleaners that will actually clean your home without using chemicals to do so. One option is to use Tea Tree oil while cleaning. Tea Tree oil, taken from the Melaleuca alternifolia tree in Australia, is a wonderful, non-chemical essential oil. The Aboriginal people in Australia have been using the oil, found in the leaves of the tree, for thousands of years for killing bacteria, to help with achy muscles, and other health-related uses. 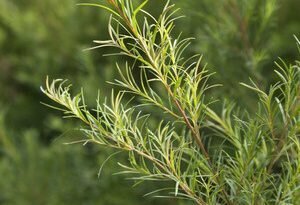 Tea Tree oil has antiseptic, antibiotic, antiviral, and antifungal properties. (Tea Tree oil should not be ingested.) Recently, however, Tea Tree oil has been touted for more than just medicinal uses. Following are five non-medicinal uses for Tea Tree oil. 1. Since Tea Tree oil does have antiseptic properties, it is a great addition to your warm mist vaporizer to help disinfect the air after someone has been ill in your family. Adding six to eight drops to the laundry when washing the linens following an illness is another good idea. 2. You can make a homemade all-purpose cleaner that will rival any store-bought, chemical cleaner. One such recipe is to combine three or four drops of Tea Tree oil with two tablespoons of vinegar and one tablespoon of borax. Add this mixture to a 12 ounce spray bottle and fill it up with warm water. Shake to combine and use as you would a store-bought cleaner. 3. Adding a drop or two of Tea Tree oil to your soap dispenser in your dishwasher prior to adding soap will help to disinfect your dishes, as well as getting them clean. 4. To kill germs in your laundry, add a few drops of Tea Tree oil to each load of laundry. Not only will it disinfect your clothing, it will leave them clean and fresh smelling, as well. 5. Do you have household pests such as ants? When you find a line of ants, follow the line back to the point of entry. Place a few drops of Tea Tree oil where the ants are entering the house. This will deter the ants from returning through that same point of entry. Wiping down cupboards with a solution of Tea Tree oil and water will also deter roaches, should you ever find them. These five ways for using Tea Tree oil around your home are just a few available. Yes, Tea Tree oil is natural, but like any other natural substance, just because its natural does not mean that its safe. Research has shown, however, that Tea Tree oil, if used properly, will help make your home the cleanest it possibly can be. Corked is a portable aromatherapy device that diffuses unique blends of vitamins and essential oils for a new approach to aromatherapy. All of the blends at Corked are made of organic, all-natural ingredients like vitamins, minerals, and essential oils. After a blend is made it is filled into a high-quality stainless steel device which diffuses the liquid that is infused with a blend of essential oils from plants as well as Vitamin B12. Corked only obtains ingredients from reputable United States based companies. In order to account for divergence in supply, Corked purchases ingredients from a variety of companies. Each blend has its own web page that discusses the specific essential oils list for that blend, as well as how each of the essential oils is used in aromatherapy. In order to enhance the aromatherapy experience for Corked users, Vitamin B12 is included in all blends. Aromatherapy is all about balance, pretty much like everything else in life! If you're sure to stick to using the diffuser as directed, it will increase the overall life of the battery and diffuser, and it will also ensure that you're getting the best possible aromatherapy experience with Corked. Learn more about the revolutionary Corked Essential Oil Diffusers now!